Leaving hotel room today. Close door, get 4 big suitcases in hall. All four of our keys are behind locked doors so Greg goes to get new ones. Upon his return, I say, “I also can’t seem to find my cell phone.” He enters the room and turns it upside down. I look on the carpet, I’ve been sitting on the phone in the hall. I find my glasses, in the case where I put them in my suitcase. I don’t remember doing that AT ALL. We close the door pick up our things and go on. Greg never gets mad, not even testy. No matter how many times we exit a hotel room this way. Life has been so busy lately with the book’s release and travel and finding things I have lost, that when I do cook I want it to be fast and easy and delicious. One of the things I enjoy the most at some of the great Italian restaurants we’ve visited on our trip to Oregon this week, is fresh homemade bread dipped in a little plate of olive oil, good aged balsamic vinegar and a little garlic. Heaven. Recently I found a way to turn Heaven into a quick snacky meal or a wonderfully easy appetizer for a bunch. 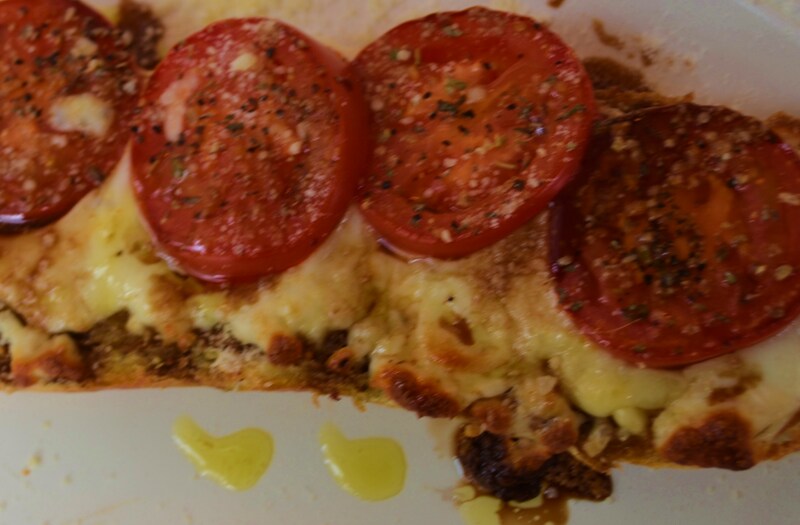 Cutting a nice fresh loaf of French bread lengthwise, I sprinkled it with cheese, then layered sliced fresh garden tomatoes, followed tiny pinches of salt, pepper, basil or oregano (fresh or dried, whatever you have on hand), a little fresh grated garlic. Pop this in the oven until the cheese melts and tomatoes are sizzling. Then, here’s the fun part: drizzle it all with good olive oil and balsamic, cut in slices and serve with plenty of napkins. Put both baguette halves on a baking sheet, cut side up. Sprinkle about ½ cup grated cheese on each side. Slice tomatoes and place atop both pieces of bread, overlapping slightly as shown. Sprinkle each half with a little fresh salt, some turns of fresh pepper, the herbs and garlic. Place in oven for about 5 minutes or until baguettes are hot, cheese is melted and tomatoes are sizzling.